In 2013, the Canada Agriculture Museum in Ottawa removed the genetically engineered goats from display after public pressure. The Central Experimental Farm in Ottawa is run by Agriculture Canada and houses the Canada Agriculture Museum with animal barns designed for family visits. Two genetically engineered (also called genetically modified or GM or – in this case, transgenic) goats were put on display at the Canada Agriculture Museum, Central Experimental Farm in Ottawa. 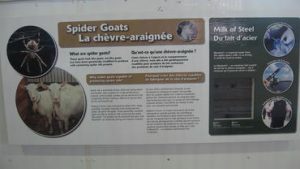 The GM goats are displayed with the sign “Spider (Transgenic) Goats” because they were genetically modified with genetic material from spiders, to create a silk that can be extracted from their milk to make textiles such as bulletproof vests. The final product is trademarked “BioSteel” but is not commercialized. Display signs at the museum said: “What are spider goats? These goats look like goats, act like goats, but have been genetically modified to produce milk containing spider silk proteins”. The display showed that the silk from the GM goats could be used to make bulletproof vests, fishing line or medical sutures. The display did not mention that the company that developed the technology does not exist anymore or that the GM silk is not being produced anywhere in the world. The Canadian company, Nexia Biotechnologies, that developed the GM goats no longer exists. Nexia Biotechnologies was founded based on GM goat research at McGill University but was delisted from the Canadian Stock Exchange in 2009.